Kendra, Dottie, Vicki, and Breanne—they're here to help you. Let's Get Right Down to It: What Does It Cost? For undergraduates, tuition, fees, and room and board for 2019–2020 add up to a total stated cost of $57,110 for resident students and $44,790 for commuters. However, 99% of our undergraduates pay less than this—often, they pay much less. In fact, for the 2018 incoming class, the average total expense was $19,862 for students who filed the FAFSA and demonstrated financial need (includes resident and commuter students). We craft each one of our financial aid packages to meet your family's specific needs and circumstances. Scholarships are a big part of the equation, along with manageable loans and work-study options. Our financial aid staff gives close consideration to you and your family's financial circumstances. 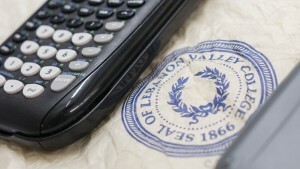 Throughout your years at LVC, we will be personally available to you to answer your questions and address changes in your life, so that you can focus on what's most important: your studies and your future.